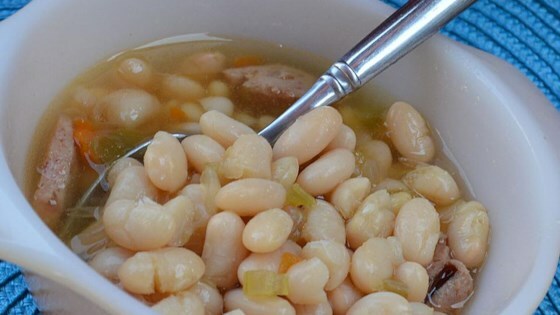 "Use smoked ham hocks to add hearty flavor to a navy bean soup made from scratch." Place navy beans into a large pot and cover with cold water by 2 inches. Bring to a boil, reduce heat to low, and simmer for 5 minutes. Remove pot from heat, cover, and let stand for 1 hour. Drain beans. Use a small piece of kitchen twine to tie parsley and thyme sprigs and bay leaf into a small bundle. Place soaked beans, herb bundle, ham hocks, carrot, onion, and garlic into a large soup pot or Dutch oven. Pour 8 cups cold water over ingredients. Bring to a boil, reduce heat to low, and simmer until beans and ham hocks are tender, about 1 1/2 hours. Turn off heat; remove ham hocks and let cool. When they are cool enough to handle, remove meat from the bones, discarding the bones, fat, and skin. Chop ham into small cubes. Remove and discard herb bundle. Transfer about 3 cups cooked beans along with some cooking liquid into a blender; puree beans. Pour pureed beans back into soup, add cooked ham, and bring back to a simmer over medium heat. Season with kosher salt and black pepper to taste. See how to make a hearty bean soup with ham and spices. Really good. Used dried herbs instead of fresh, 4 cups chicken broth and 4 cups water, 1 lg smoked ham hock with lots of ham on it, and chopped celery. Very tasty.